BBC MasterChef: The Professionals winner Jamie Scott today (2 February 2015) launched a new campaign to promote Scotch Beef PGI which was recently named Scotland’s favourite food*. Jamie, who is head chef at Rocca Restaurant, St Andrews, joined staff at The Macallan distillery in Speyside to raise a glass of one of world’s most iconic Scotch whiskies to the success of the campaign, which aims to very clearly differentiate Scotch Beef. The nine week Quality Meat Scotland campaign, which kicks off this week, has a strapline of “There’s beef, there’s Scottish beef, then there’s Scotch Beef”. It will showcase Scotch Beef and the flavour, provenance, traceability and integrity which underpin the brand’s PGI (Protected Geographical Indication) status. Over 4.7 million consumers will be targeted across Scotland and Greater London during February and March to inform, educate and inspire them to use Scotch Beef when they cook. Jamie, who selected Scotch Beef as the main course for the final of MasterChef, donned his chef whites to serve up a delicious Scotch Beef dish at The Macallan Distillery to toast the launch of the campaign. Jamie said: "Scotch Beef is a premium product and I am not surprised in the slightest that it has been named Scotland's favourite food. “I want to help share our love of Scotch Beef with consumers across the UK especially given that 2015 is Scotland's Year of Food and Drink. "It is such a versatile product and although it is simple to cook with, it is also very impressive which is the main reason I chose to include it in my final dish on MasterChef and feature it regularly on the menu at Rocca St Andrews. I always look for the Scotch Beef logo so I know I'm getting the best." Laurent Vernet, head of marketing at QMS, said: “By targeting professionals, food enthusiasts and busy families alike, this campaign aims to show just how simple and versatile cooking with Scotch Beef can be. It is an every day premium product that can be enjoyed as part of a healthy, balanced diet. PGI status guarantees the meat is sourced from selected Scottish farms that must adopt best practice regarding animal welfare and natural production methods. The PGI is a guarantee of a genuinely authentic product. Photo :: Masterchef Winner Toasts Launch of New Scotch Beef Campaign BBC: The Professionals winner Jamie Scott today (2 February 2015) launched a new Quality Meat Scotland campaign behind Scotch Beef PGI, recently named Scotland’s favourite food, following an independent survey. Jamie, who is head chef at Rocca Restaurant, St Andrews, joined staff at The Macallan distillery in Speyside. 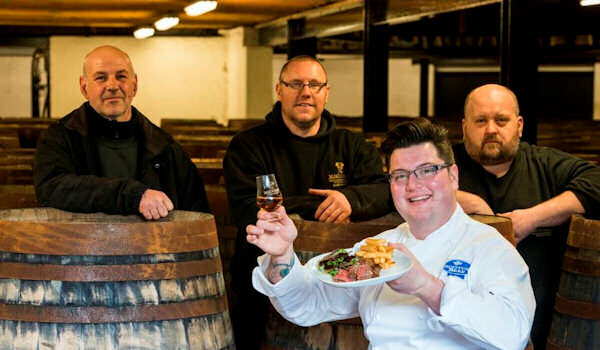 (LtoR) Alan Taylor, Mark Wheeler and Richard Burgin to raise a glass of one of world’s most iconic Scotch whiskies to the success of the new campaign, which highlights the quality of Scotch Beef and aims to very clearly differentiate Scotch Beef.